This event will be held on Saturday, January 7th, beginning at 10am, and will run through the day. 11:00 Gunners of Moulders Company of artillery, will drill and fire their cannon on the parade ground of the Old Barracks, while explaining the importance of artillery in the Continental army. 1:00 Soldiers of Charles Wilson Peale's company of the Philadelphia Associators form up on the Parade ground and perform a muskets demo, showing the drill and tactics used by some regiments of the Continental army at the beginning of the American Revolution. 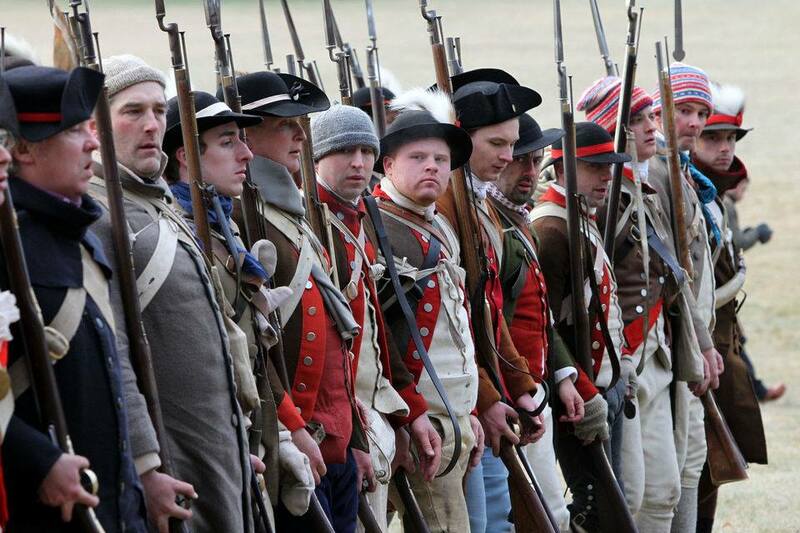 3:00 Soldiers of Charles Wilson Peale's company of the Philadelphia Associators form up on the Parade ground and perform a muskets demo, showing the drill and tactics used by some regiments of the Continental army at the beginning of the American Revolution. 4:00 Tour of the Second Battle of Trenton. Matt White will retrace the final steps of the second Battle of Trenton. Known as the Battle of the Assunpink, this is the largest of the three major battles fought during the Ten Crucial Days campaign. Mr. White will discuss how this battle, although often overshadowed, was for those present one of the most harrowing and memorable moments of the war. Tour will start on the parade ground of the Old Barracks Museum.